The Richmond Arms is a lively bar for Gay men, women, and their friends! People instantly love our mixed bar, with a wide range of age groups and activities. We are a 5 minute walk from Richmond train station and have good bus routes close by. We have many drinks offers on such as house doubles for £4.75 (excluding mixer), double vodka and Red Bull for £6.25 also 2 cocktails for £6.95. Check out our Super Savers range, between 7 and 9 pm every day and all day Sunday. The Windsor Castle is West London's friendliest and most welcoming gay pub, offering fun and entertainment 7 nights a week, ranging from karaoke and Quiz Nights to live cabaret, go-go boys, big money, theme parties and top-name entertainment! 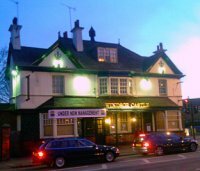 Large pub with dance floor, beer garden and piano bar. Regular cabaret and entertainment throughout the week. Music: Pop, retro and funky house. Young crowd with their mates. Thursday from 6 pm until 1 am, Friday and Saturday from 6 pm until 2 am and Sunday from 6 pm until 1 am. Fulham's only gay/TV/TS members club. Small club bar in West London. Thursday and Sunday TV/TS nights.